Lovely and visual performance about shapes, colours and sounds from the world-known dance company TPO! 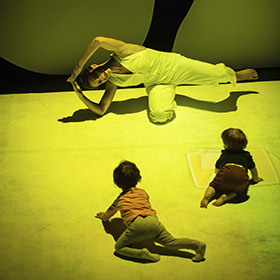 Two opposite characters, each with its special nature and quality of movement, collide, meet and present themselves.The meeting of the two characters immediately inspires play and the scene opens up to the public, becoming a place where children can experiment: explore the space, shapes, sounds and colors put into play for them and around them. Shapes, sounds and colors react and come to life as a result of their movements and thus compose a great design.